An air source heat pump (ASHP) is a form of renewable energy. It offers many benefits to homeowners and businesses, including savings on heating bills and reduced pollution. Air source heat pumps are ideal for small to medium properties currently using stored gas or oil, especially where oil and gas are either expensive or difficult to deliver. 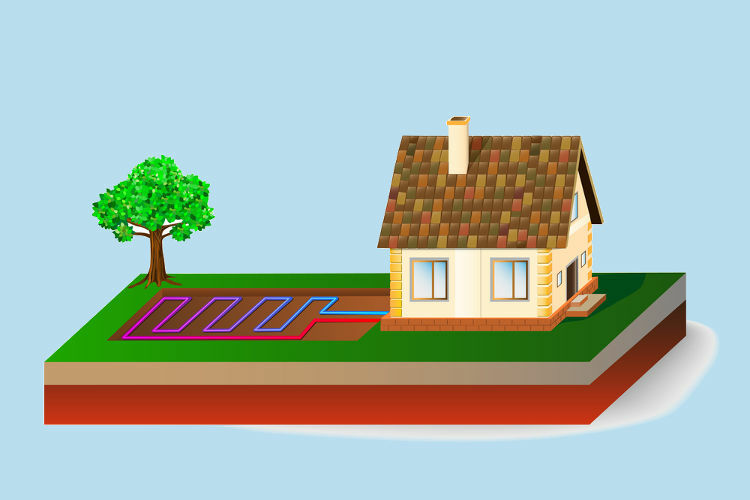 Read below to learn how air source heat pumps work, the main benefits of installing one in your home or business, and things to consider before installation. An air source heat pump operates like a refrigeration system but in reverse. Instead of removing heat from a cold store or freezer store and rejecting this heat to the outside air, the ASHP absorbs the heat from the outside air, and via the refrigerant circuit transfers the heat to a stored vessel of water. The water within this vessel is heated to the systems required design temperature which in turn supplies heat to your central heating or hot water system. Taps, radiators, under-floor heating, fan convectors can all be supplied hot water like a standard system. Reduced carbon footprint – unlike burning oil, gas, LPG or biomass, a heat pump produces no carbon emissions as heat is generated from air outside. However, the unit still uses some electricity to run, therefore it isn’t completely free of carbon emissions. Reduced energy bills – as heat is taken from the air outside rather than using electric or oil, heat pumps are cheaper to run than direct electric heating and oil boilers. Financial support – the Renewable Heat Incentive (RHI) is for domestic, commercial, public or industrial users of air to water heat pumps. The scheme will pay owners of air source heat pump systems for every unit of renewable heat produced for up to seven years. Click here for more information. Safe – as there is no combustion involved and no emission of potentially dangerous gases, air source heat pumps are considered to be very safe. Planning permission – installing an air source heat pump under certain conditions in England and Scotland is considered permitted development, so planning permission is not often required, although you may want to check with your local planning officer. Space – an air source heat pump requires a unit to be fitted outside your home (either on the ground or on a wall), with plenty of space surrounding it to ensure a good flow of air, so it may not be suitable for small properties with limited outside space. Insulation – if a property is not properly insulated and suffers from draughts, the heat generated from an air source heat pump is not going to be efficiently used to heat it, so another form of renewable heating should be considered. Design – we can provide an initial site survey and heat loss calculation with hot water use and re-heat time to determine the capacity and design of a air source heat pump suitable for your property. Install – our installation team are qualified and trained to ensure your air source heat pump is fitted to the highest standard.